I loaded Genesis 2 (Stephanie 6 HD) and want to start shaping the head and body in Carrara. At the top level (animation) it reads Stephanie 6 HD. On the second level, I get pose parameters. On the third level called 'actor' I get the head and body morphs. Yes and no. I cannot remember all of the steps you have to take manually, and I hated doing it, so I stopped. Then Fenric came out with a plugin that adds Edit > Fenric > Change Bone Visibility to Carrara. So that's what I use now and get it all done in the one click. Perhaps the next poster will know the process for doing them all individually. Unfortunately I cannot post a link to Fenric's store outside the DAZ 3D store. Just do a search for Fenric's Den and you'll get there. Look for the Bone Visability plugin... you'll be glad you did - and it's really inexpensive! Also, if you like those tools, I think you can get them all as a bundle, here at DAZ 3D in Fenric's store page. Indeed a more than reasonable price for such a useful tool. He's a look at how Fenric's tool works. As you might notice, I have a nice collection of Fenric's tools. Each time I add one it seems to make my Carrara life even more enjoyable - and this is always a constant for me. Seriously. I started with some of the Pose tools he has Here, at the DAZ 3D Store, and ended up collecting all of those, and most others. I had some sort of confusion at his Den store after he opened that. But he helped: Just don't trying logging in when making a purchase. But this held me from getting those for some time, until this bone vis one came available - I just had to have that! But since I don't have that many from his Den store, I'm planning to get his latest Shading Tools collection here at DAZ, since it contains the ones I don't yet have. I may well get some of these also. Next month or so. I have also been looking at some other plugins like fall-off shading, but they are not yet updates to 8.5. I was refering to the shoestring fresnel and angle shaders. I did download Sparrowhawke's free fresnel shader, but that has been beta for some three years now (I read). when you're creating morphs, or just re-shaping the model's head,. you'll be in the "vertex mo0deller", ..or modelling in the assembly room view. Either way, you won't see any bones, ...since you'll be modelling the mesh. if I understand you correctly, .. You want to create a new morph or edit an existing morph on the figure,...rather than adjust some parameter settings to adjust an existing shape or expression. 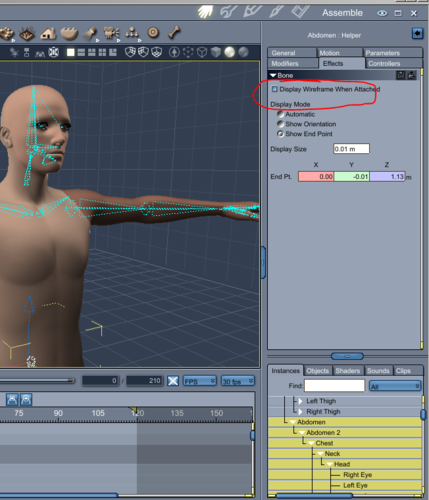 The bones will only show up when you select the actor (to allow you to animate it). Most of the time the bones aren't visible in the scene,. I'm still quite new to Carrara (this is my first version) and I was in fact rfering to parameter settings. The rest will come later. Right. It's a pain when you're trying to create a specific face or body shape and those bones are so obstructive. There's actually a way to do each bone manually, but it takes going through each of them separately and turning of the bone visibility. I downloaded the trial and bought the key. It really adds a functionality that should in fact be present in the app itself. You'll see how glad you are in times to come. Hi Erik.... as pointed out, are you just using the parameters for posing, morphing that are under the PARAMETERS tab and maybe add/purchase some additional pose morphs available for your figure? There are sections for ACTOR, HEAD and HANDS... as well. And you can also manually move the joints by using the Universal controller in the tool tab on the left. I just use the axis/roatation one and not the size or movement one. Also it helps me to see if I've gone wrong with delicate places like collarbone/shoulders if I pose moving the joints with the axis rotation controller, whether with Constraints on or not. It's easy to get it wrong. DART.... So does Fenric's plugin let you click to appear or disappear whilst working? That would be great. Right up there with just learning the other day you can go to the Animation tab whilst in the Assembly Room and Zero the figure back to original position when you bugger posing up. Hand grasping/finger positions seems to be something that Genesis Figure's HAND Parameters does NOT like perform well the fingers get all distorted ! That Zeroing utility is amazing, thought, and has been a new suggestion, at least to me. Yippee! I am happy with discovering the simple fixes. I love how well it works without them visible... truly. And... right! When we apply a pose that poses the fingers, using the pose dials on the hands can have some goofy results. The same can happen if you use the pose dials to create a relaxed default pose for your characters. Don't do that! When I make my default poses for my heroes, just prior to saving them as CAR files into my Carrara browser, I actually pose each joint that I want poses - not the pose dials. So my more common quick set would be to rotate each shoulder down to the side of the body, and a little more refinement to make a decent looking blank pose. Since I make most of my poses by hand, it took me a while before I discovered that.. what a blast! I knew right away what had happened... but it still made me feel sorry for Genesis 2!